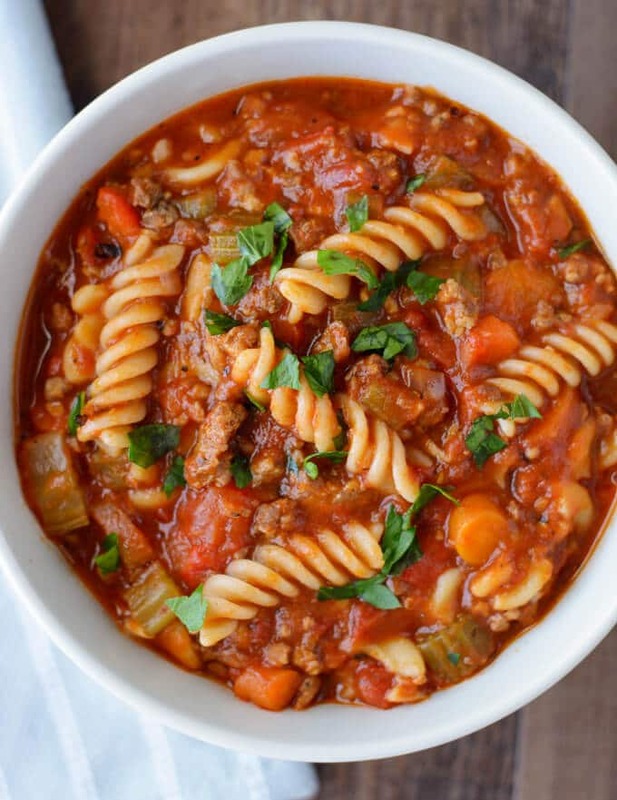 Come home to a super hearty and delicious one pot meal with this Slow Cooker Italian Sausage Soup with Pasta! It’s still not exactly soup season here in Texas, but we did get to experience two days of Fall-like temperatures this week. On Tuesday, it was actually a bit chilly and the perfect time to serve up this Italian Sausage Soup. Unlike last week, when we were sweating while eating a big bowl of it. Ha! Healthy slow cooker meals are truly a cook’s best friend. My husband and I work out after he gets home from work for the day. So, by the time we get back and get showers, it’s going on seven thirty many nights. Later than that, if we have to stop by the store too. This soup is perfect for those days. The crockpot does all the work while I get other stuff done. Then, I just stir in the pasta and get a shower while it cooks. By the time, we’re done with that, the pasta is cooked through and dinner is ready! I used Jovial Foods brown rice fusilli pasta for my soup. It cooked up perfectly in the crockpot. I’d never cooked pasta that way before this soup recipe, so I wasn’t sure how it would turn out. Cook times might vary if you use a different type of gluten-free pasta. I’ve only tested it with the Jovial Foods brand. The roasted bell pepper adds another dimension of flavor to the soup. You can use either a homemade roasted bell pepper or one from a jar if that’s what you have on hand. Or, if you just want to use a regular red bell pepper, you can do that. It’s all up to you. 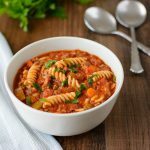 I’m sure this Slow Cooker Italian Sausage Soup with Pasta will be in regular rotation throughout this coming Winter. So easy to make and we both love it! Use a 5 or 6 quart slow cooker. In a large skillet, heat the oil over medium-high heat. Add the sausage and cook until browned, breaking it up with a spoon or spatula as it cooks. Add the onion, carrots and celery to the skillet and let cook, stirring occasionally, until veggies have softened, about 5-6 minutes. Place into slow cooker. Add the garlic, tomatoes, seasonings, bell pepper and chicken stock to crockpot and stir together. Cover and cook on low for 8 hours or on high for about 4 hours. Raise the heat to high, stir in the pasta, re-cover and let cook until pasta is tender, about 20-25 minutes or until pasta is tender. Check seasoning, then serve. Pasta cook time could vary depending on what type is used. The Jovial Foods brown rice pasta took between 20-25 minutes. Pasta soaks up a lot of liquid, so the longer it sits the less soup-like it will be. If you are fine with a thicker consistency, cook the pasta in the crockpot. Or, if you prefer, you can cook the pasta on the stovetop and place your desired amount into a bowl and ladle the soup over it. 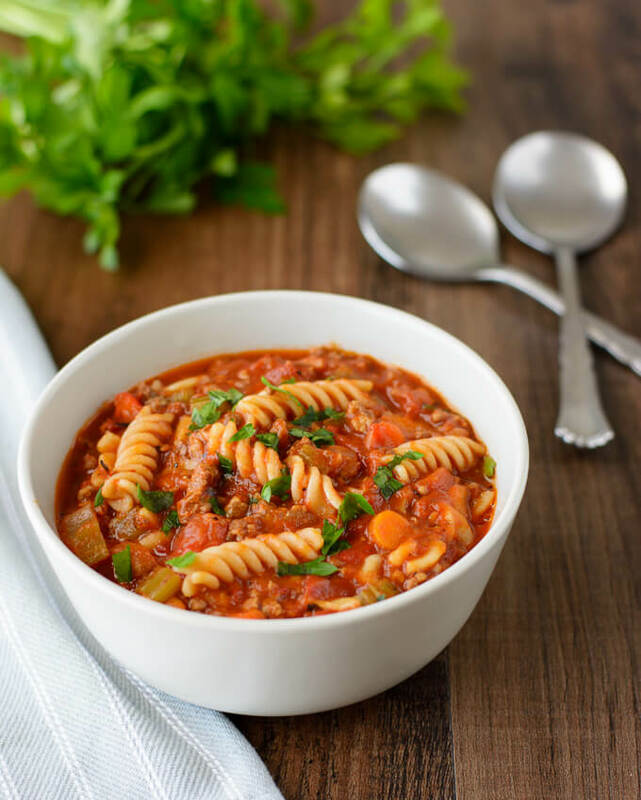 If you are preparing the pasta on the stovetop, store the pasta and soup separately. By Tempie at March 23, 2018 .